Just because you're getting older doesn't mean that you're getting worse, in fact you're only getting better. 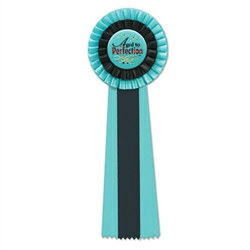 The Aged To Perfection Deluxe Rosette Ribbon is the perfect way to remind someone who is getting up their in years that he or she is still an awesome person. The striking contrast between black and turquoise in this ribbon is sure to catch the attention of everyone. The Aged To Perfection Deluxe Rosette Ribbon features "Aged to Perfection" on the top of the ribbon in metallic lettering. This item is sure to please, as would the Aged to Perfection Blinking Button and Aged to Perfection Certificate.